NaNoWriMo is all about unlocking the story inside you. It's heralded as a 'Write A Novel In A Month' month but that's not really true. Because it's not about writing a novel - not really. It's about finding a story, spilling it out for thirty days after which you hopefully want to clean up the mess and make something worthy of it. NaNoWriMo is about self-discovery: Can you do it? Do you love writing enough? Do you really want it? Do you actually have anything to say under the gun? Expectation: You think your life will continue in a normal fashion. 1667 daily words will only take an hour or two and you think you can bang those out without interfering in your family's daily routine. Expectation: You think it won't be that hard. Reality: Ha! Fool! It will be excruciating and you'll want to quit at least once every day. Expectation: You think people will care. Reality: Ha! Fool! People won't care. They might be mildly curious. They might tip their head to the side like they're talking to a widow and say, "Aw...good for you!" They'll only really care when your obsessive writing interferes with their regular life. 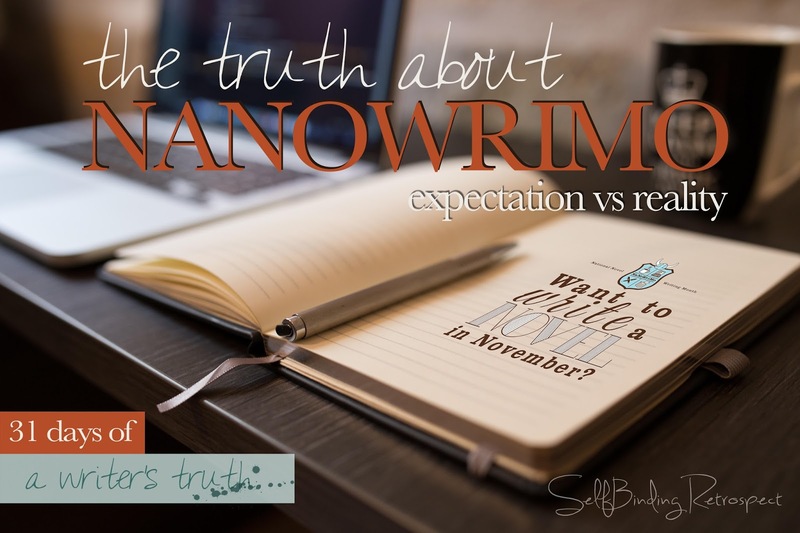 Expectation: On November 30, you will submit your words to the NaNoWriMo official word-counter, receive your celebratory email and certificate from the NaNoWriMo offices and have a shiny new novel ready to send to a publisher. NaNoWriMo is about the beginning. It is not about the end. It's about the journey, not the destination. It's the tool that will put you on the road towards a novel and it's a journey worth taking if you've got the guts. 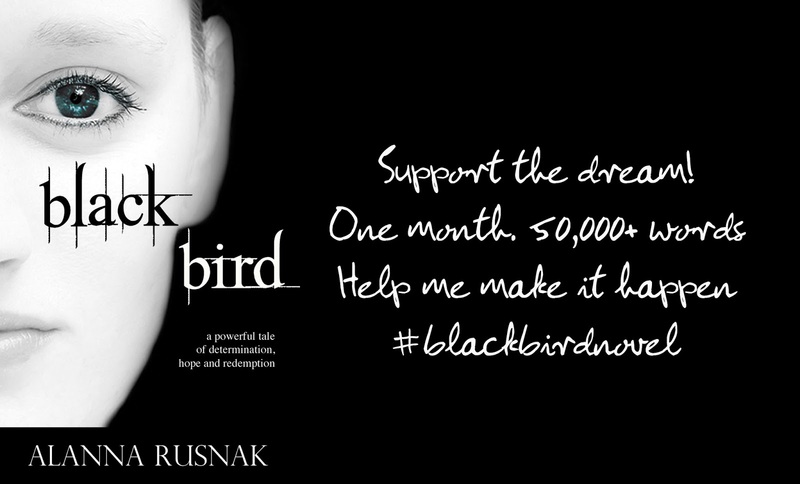 Black Bird is a novel project that died a few years ago. I had a rough start and no guts. I'm going to revisit it this November - strip it back to the bones and start again - and hope the pressure will resurrect it into the story I'm confident it can become! #TeamNoDelete I'm in. NOOOOOO idea what I'll write about but I'm in. Oh and @Alanna, you should see how I transformed the table I bought from the resale store...Completely different piece of furniture. Yeah???!!! That's so exciting - both that you're going to do NaNo and that you've transformed a table. Can't wait to see both of your projects! Haha! Your "Ha Fool" cracked me up every time. I am so interested and want to but I don't know what the story in me is..... I've had a few ideas but to make those into more than a short story... it's been a dream for as long as I can remember though. My comment deleted again. I need to start copying them before I hit publish just in case. I *may* have done the typical me thing and signed up.the other night with just a few tidbits of idea that have been perking for a month or two. I am mildly freaked out, I have a midwife assistant class the first weekend so being away for 3 days will make it interesting. I figured if I fail, at least I tried. There. It worked on the 5th try but only as a Google comment. Odd. Oooo, I'm so excited for you - no matter what it'll still helps you get started right?! Can't wait to hear what you'll be working on!